The Democratic Unionists have said that they would require a "prolonged period of assessment" to determine whether the IRA has given up its armed campaign. After meeting Tony Blair, DUP leader Ian Paisley said the IRA had made a statement but had done nothing about keeping their obligations. He called for "total decommissioning that everyone can be satisfied with". 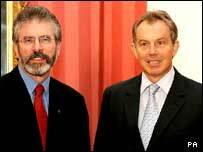 After a separate meeting with Mr Blair, Sinn Fein's Gerry Adams said he thought devolution could be restored soon. Mr Adams added he believed that the outstanding elements of the Good Friday Agreement would be implemented "in the period ahead". Thursday's talks in London between the two party leaders and Prime Minister Blair are the first since last week's IRA statement in which it said it was ending its armed campaign. Mr Paisley said: "We are not going to have any discussions about devolution until the requirements Mr Blair set out are fulfilled by the IRA," he said. His deputy, Peter Robinson, added: "It will take a long period of time to make sure that they are gone and they are gone for good." 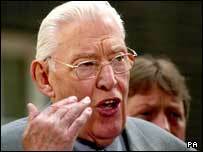 Mr Paisley said he had presented a list of demands to the prime minister in what he described as a "blunt" meeting. These included assurances relating to the government's announcement that it planned to disband the three home-based battalions of the Royal Irish Regiment. After Sinn Fein met with Mr Blair, the party's Martin McGuiness said the DUP had to "regain their nerve" and recognise they had a major contribution to make to the peace process. "The ball game has changed, changed completely and I think forever," Mr McGuinness said. "At some stage the DUP will have to respond to an agenda which is very clearly moving on without them." On Wednesday, the DUP said they had set out a series of time penalties which would apply in response to "any further concessions from the government to republicans". They said they believed devolution would not return for a minimum of two years. The Northern Ireland-based battalions of the regiment are to be disbanded on 1 August 2007, as part of the response to the IRA ending its armed campaign. The Army will end its support role to the police on the same day. Secretary of State Peter Hain also announced that troop levels in the province would fall from 10,500 to 5,000 in two years time.